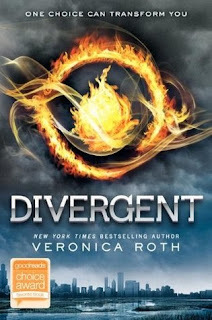 In Beatrice Prior's dystopian Chicago world, society is divided into five factions, each dedicated to the cultivation of a particular virtue–Candor (the honest), Abnegation (the selfless), Dauntless (the brave), Amity (the peaceful), and Erudite (the intelligent). On an appointed day of every year, all sixteen-year-olds must select the faction to which they will devote the rest of their lives. For Beatrice, the decision is between staying with her family and being who she really is--she can't have both. So she makes a choice that surprises everyone, including herself. When I finally read The Hunger Games series last year, I was pleasantly surprised by how much I ended up enjoying it (I think I read all three books in a week!). So, because of that, I've been intrigued by what other bloggers and readers have been saying about Divergent. But it wasn't until I found a used copy for sale at a mere 20p that I seriously considered reading it. My experience of Divergent is mixed. Although I didn't particularly like Tris at the beginning, she grew on me as the novel progressed. I enjoyed watching her relationships with the other characters unfold, and I particularly looked forward to any encounters with Four. Tris is strong, brave, and knows what it takes to survive in such an unstable environment (much like Katniss), so she makes a good role model for the target demographic. There's also no mistaking the quality of Roth's writing style, which I loved for its vivid, cinematic tone. I felt everything Tris goes through, and saw everything through her eyes in remarkable detail. I also bookmarked several pages, just incase I want to revisit them for their descriptions or their wisdom. However, as I've hinted, I didn't have a complete love affair with Divergent. It just seemed a little too slow, and much of the time I wondered when the build-up would finally reach boiling point. But I realise that all this detail is necessary, and this has lead me to assume that Divergent is actually the prequel to the really exciting stuff. For that reason, I am eager to read the next book, Insurgent, which I'll probably start as soon as I've posted this review! Altogether, Divergent is an absorbing, wise, and occasionally romantic tale of survival against the odds. If you're wondering what the next Hunger Games will be, it'll probably be this – Divergent is also being made into a film starring Kate Winslet (who happens to be my favourite actress!). ETA: I've changed my rating from 3.5 to 4 as, a week later, I still can't get this book out of my mind!